celebrity charity – the ajayi effect. Written for The Hollywood Reporter, the essay begins with Jay-Z writing about Kalief Browder, the young black man who was wrongfully convicted of a crime he did not commit and served at Rikers Island for three years. The rapper and entrepreneur then talks about the documentary series he made on Browder, Time: The Kalief Browder Story, and the importance of demanding change from the people we put into office. It’s Lit (thanks to Akon). One of the first celebrity philanthropic projects I worked on was over a decade ago under the helm of Senegalese -American R&B singer, Akon. It was with the Konfidence Foundation which concentrates its efforts in Senegal and West Africa to empower individuals, communities and nations. It’s great to see that he’s still dedicated to doing great work. Recently, Akon launched an ambitious project to provide millions of Africans with electricity through a groundbreaking solar power initiative: Solar Academy. The academy, scheduled to open in the Mali capital of Bamako, will train locals to install and maintain solar-powered equipment. The Solar Academy is under the umbrella of the singer’s Akon Lighting Africa (ALA) initiative, launched in 2014 to bring solar power to Africans who currently live off the grid. Akon’s ALA initiative, in partnership with Give1Project and ADS Global Corporation SA, has already provided solar power to more than 1 million households. ALA has installed solar-powered streetlights in more than 11 countries on the continent. The initiative includes installing solar-powered streetlights and residential solar systems in African villages, as well as solar tailored equipment in households. There are an estimated 600 million people in Africa who live without electricity. Twenty-five African countries are experiencing an energy crisis, according to the World Bank. I am rarely home on Friday night but after a doosie of a week (more on that another time), I nestled on my couch, flipped on the TV (yes, I still own one) and was surprised to see that Hollywood was hard at work towards a better tomorrow simultaneously on all of the major networks. Celebrities including Jessica Biel, Kristen Bell and Austin Mahone all came together this evening in Santa Monica, Calif. for the Think It Up telecast, a fundraiser aimed to support students and teachers across the nation. Justin Bieber kicked off the hour-long event with a performance of his new song “What Do You Mean?” before handing it off to a number of A-listers who discussed the current state of education, and what everyone can do to improve it. Ryan Seacrest, Jennifer Garner, Wilmer Valderrama and Halle Berry were on hand to reminisce about their own classroom days, and Matthew McConaughey took viewers inside U.S. schools working to unlock student potential. 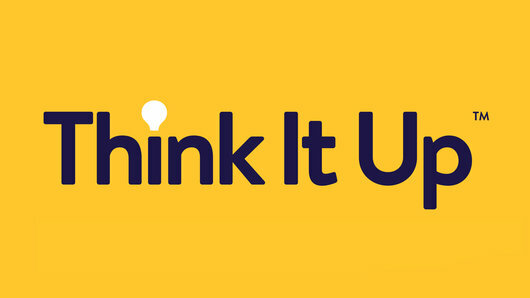 Think It Up is an initiative of the Entertainment Industry Foundation charitable organization, created to bring broad cultural attention to the urgency of improving the learning experience in America. The national education initiative will seek to re-frame the public discussion about education, create a culture of excitement about learning everywhere in America and build a sense of optimism about the potential of education in classrooms across the country. Overall, it was a good show and informative too. I love the idea of tapping into celeb power for good. I do wish that just as the networks were taken over there was a more prominent social media component to the fundraiser. That was noticeably missing and would have been appropriate given the subject-matter. Perhaps next time? Learn more here. Shady Boots: Jay Z Gets Checked For Being Stingy – Again. In 2010, Jay-Z only reportedly donated $6,431 of his $63 million earnings to his own Shawn Carter Scholarship Fund. Out of the $87 million Beyonce earned in 2010, not a single penny went to her husband’s foundation. Online magazine, The Root, put Jay on blast (again) recently. They compared Hov’s non-giving to that of “less fortunate” rappers, The Game and Drake. After learning that Anna Angel had lost her boyfriend and five children to a tragic mobile-home fire, The two split a $20,000 donation to help Angel with the funeral expenses. It baffles me. One of the reasons I left the entertainment industry and got into non-profit marketing was because I was so tired of seeing fans worship celebrities that could care less beyond an album sale. That was almost a decade ago. One would think that things have changed. apparently they haven’t for the majority. Here’s hoping Jay secretly learned a lesson from Game and Drizzy’s actions. I would bet that even if he did, he’d keep that to himself. Check out The Root’s article here. I love Oprah. You love Oprah. The Smithsonian loves Oprah…and they have 12 million plus reasons to do so. That’s because the philanthropist and media mogul is donating $12 million to them. Combined with the $1 million she gave in 2007, it is the museum’s largest donation. The National Museum of African American History and Culture. Ground was broken on the five-acre site, adjacent to the Washington Monument, in February 2012. Congressional funding accounts for half of the museum’s $500 million design, construction and exhibition costs. The museum is raising the remaining $250 million. The museum has received a $10 million donation from both the Gates Foundation and the Lilly Endowment. The Museum of African American History and Culture, which hosts a gallery at the National Museum of American History, is scheduled to open in 2015 (um, I can’t wait for it). • Kenneth I. Chenault, chairman and CEO of American Express Co.
• Ann M. Fudge, retired chairman and CEO of Young & Rubicam Inc.
• Quincy D. Jones, CEO of Quincy Jones Productions Inc.
• E. Stanley O’Neal, former chairman and CEO of Merrill Lynch & Co. Inc.
• Samuel J. Palmisano, chairman and CEO of IBM Corp.
What’s All Of The Chiming About? For the past few days, I have been taking in news stories that feature glossy and celebrity packed images of Beyonce, her Boo and her buddies for the Sounds of Change concert to benefit the Chime for Change initiative. Not one of the stories has gone beyond the glitz to really explain what all of the chiming is about. Shoot, even Beyonce’s website simply states, Chime for Change, founded by Gucci, is a new, global campaign focused on girls’ and women’s empowerment. It serves to convene, unite and strengthen voices speaking out for girls and women around the world, and to raise funds for non-profit organizations pursuing change. She then directs to the Chime for Change Facebook page. I did some more digging and found that even Gucci’s website doesn’t do a good job explaining what the campaign actually is or what the goals are. Well after much research, I found out Sound of Change was broadcast to more than 150 countries across the world. Aside from raising over $4m, which will fund approximately 200 projects in 70 countries (please don’t ask which ones), the concert, attended by more than 50,000 people, was meant to put issues such as genital mutilation, domestic violence, maternal death and adult illiteracy on the news agenda. 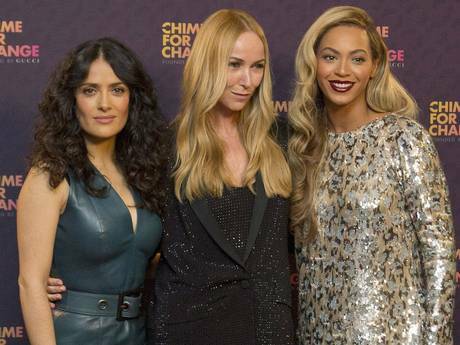 Chime for Change was founded by Gucci’s designer Frida Giannini, and her friends Beyoncé and Salma Hayek, focuses on improving education, health and justice for women around the world. Besides Beyoncé, Jessie J, Rita Ora, Haim, Ellie Goulding, Jennifer Lopez and Florence Welch took to the stage to champion the cause. Other celebrity endorsements came from Madonna, Katy Perry, Halle Berry, Jada Pinkett Smith, Julia Roberts, Gwyneth Paltrow and Cameron Diaz, who all are featured in videos explaining why they support the movement, making Chime for Change seem like a grown-up version of girl power. I ask: What about the organizations involved? The programming? How can people really be inspired to change things beyond ‘liking’ pictures and then downloading a popstar’s latest single? I can’t help but feel that a huge opportunity to truly engage people beyond a donation or a concert was and is sorely missed here. But, I will assume that there will be plenty more chiming on the way and I just might be proven wrong.